Chia seeds come from a flowering plant in the mint family that’s native to Mexico and Guatemala. Despite their tiny size, they are among the most nutritious foods on the planet. It contains calcium, phosphorus, manganese and is a great source of Omega 3 fatts. When soaked, the chia seeds increase 12 times their volume making a perfect healthy & filling breakfast option. Just 28 grams or about 2 tbsp serving of chia has 11 grams of dietary fibre — about a third of the recommended daily intake for adults. Adding some chia to your diet is an easy way to make sure you’re getting a good amount of fibre, which is important for digestive health. 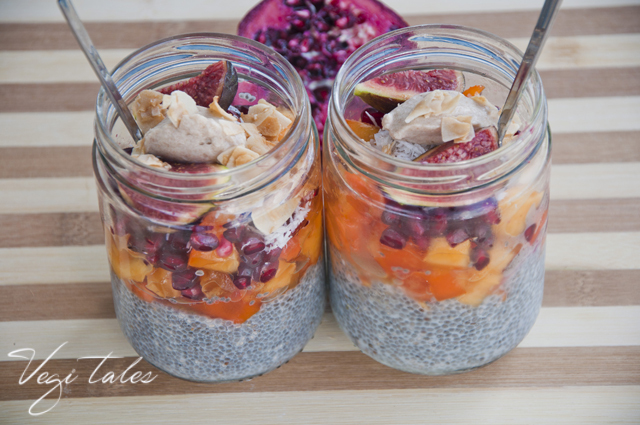 I am usually using the chia seeds for breakfast adding a fruit topping with some caramel sauce, or goji berries and agave with a sprinkle of vanilla powder. The options and endless and not only for breakfast or sweet dishes but you can add the chia to anything else desired like salads or different main dishes because the chia seeds are tasteless and will not affect the flavor of your food. The caramel I used on top was an extra element taken from leftovers from the day before. 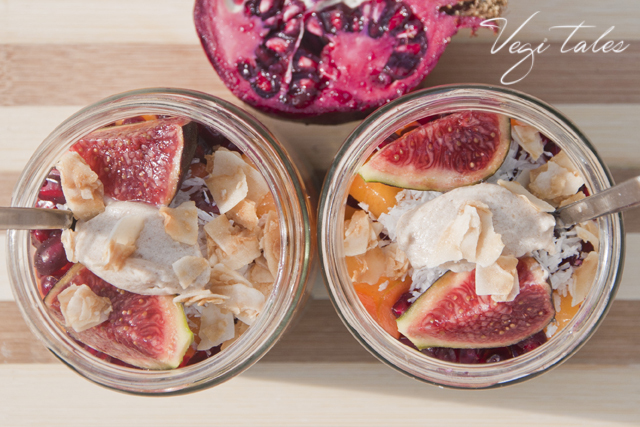 If you would like to add it to your jar as well just blend some dates and coconut milk in a food processor until you get the caramel consistency. The taste is absolutely fabulous!